Day 21 of our 25 Days of Christmas Guide features the all new ATAK 120 from Wilderness Systems. 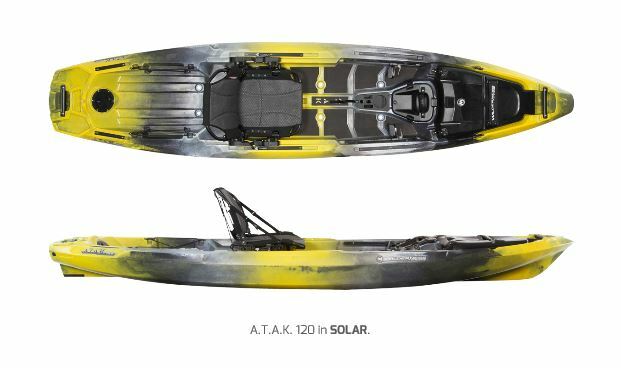 A more compact version of the already popular ATAK 140, but definitely going to become a fan favorite amongst kayak anglers. The ATAK 120 is now available at retailers so get that special angler that’s on your Christmas list the gift of kayak fishing. GREENVILLE, S.C. – Wilderness Systems today announced the highly anticipated release of its new compact, 12-foot A.T.A.K. 120 kayak to specialty retailers nationwide. The A.T.A.K. 120 features Wilderness Systems’ proprietary S.M.A.R.T. Hull Technology throughout the design that combines stability, maneuverability, acceleration, responsiveness and tracking for optimal performance in a range of environments. The acclaimed, patented AirPro MAX seat returns with improved adjustability and the addition of quick-adjust cam levers, for maximum comfort and performance. The A.T.A.K. 120 is equipped with the exclusive Flex Pod OS system, combined with two additional hatches, for ample storage space as well as the option for electronics or Helix MD™ Motor Drive integration. The A.T.A.K. 120 costs $1,649 USD and will be available in six colors: Desert Camo, Dusk, Mango, Midnight, Solar, and Sonar. Innovative designs, premium outfitting, and an uncompromising attention to detail have made Wilderness Systems an industry leader for 30 years. Today the brand continues to push the limits of technology, performance, comfort, responsiveness and aesthetics. Taking that same drive into the angling market with high quality fishing kayaks and accessories, Wilderness Systems now offers the ultimate on-the-water experience for everyone from passionate anglers to recreational boaters and expedition paddlers. Explore Wilderness Systems, part of the Confluence Outdoor family of brands, at www.wildernesssystems.com and join the Wildy Community.